TFOCA is an acronym for Tactical Fiber Optic Cable Assembly. The nomenclature identifies the cable assembly as being suitable for military use in harsh environments. The acronym is also often used to refer to the connectors sometimes in conjunction with suffixes to refer to their particular style (i.e. TFOCA II). TFOCA cable assemblies consist of plugs terminated onto cable. Panel mount receptacles come in two designs, jam nut and flange mount. TFCOA connectors are generally terminated onto tactical cable. 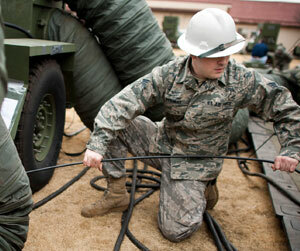 Tactical cable may be rated to mil specifications or may be a civilian version. Either is readily available to suit your needs. Learn more at www.tfoca-tactical-fiber.com or click below to order. Bulk fiber optic cable for Military, Tactical and Harsh Environment applications.